The Hamden Bridge recently went through a complete refurbishing. It was originally built by Robert Murray in 1859, it is listed on the National Register of historic Places as of April 29, 1999. 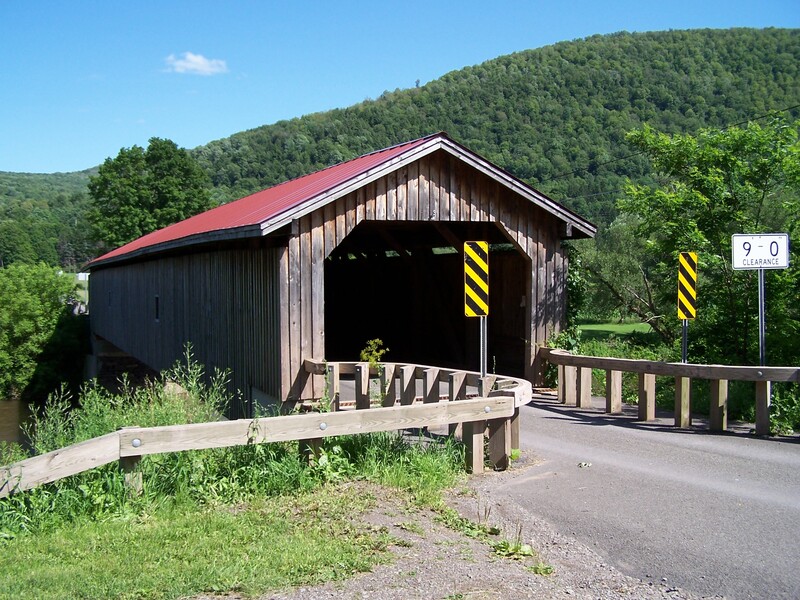 The bridge is located in the Town of Hamden, east of State Route 10, north of the village. It is over the West Branch of the Delaware River. 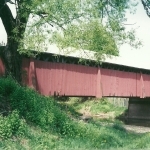 A two-span bridge of 125 feet of Long truss, the center pier is not original but was added in the 1940’s. 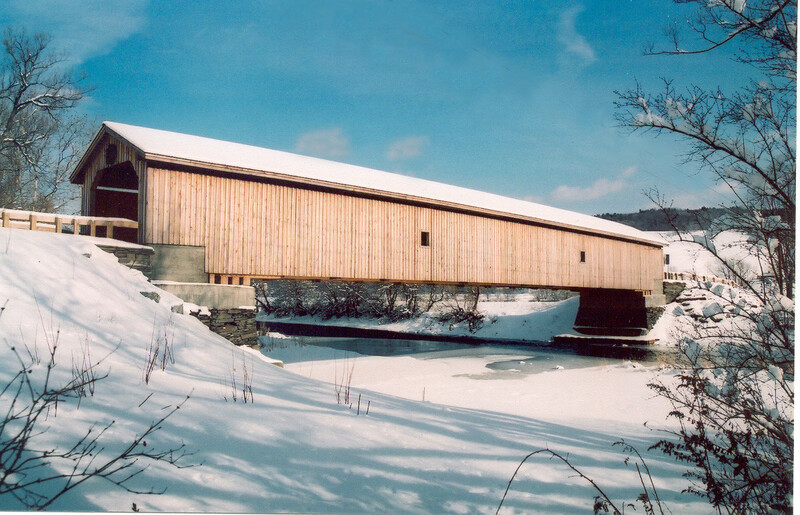 Built by Robert Murray in 1859, this 128-foot-long, single span structure incorporates the Long truss design patented on March 6, 1830 by Lieutenant Colonel Stephen H. Long of Hopkinton, New Hampshire. 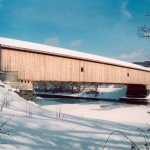 It is New York’s only covered bridge that incorporates a pure Long truss design, unassisted by an arch or Queenpost truss and is rare to northeastern covered bridges. 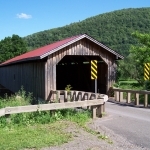 The Hamden Covered Bridge is one of three covered crossings that still carry traffic across branches of the Delaware River. A contract to construct the bridge was signed between Mr. Murray and the Town of Hamden on April 27, 1859, for the sum of $1,000. When originally constructed, the Hamden Covered Bridge was a single span, but in the 1940s, a center pier was added for additional support. During the early ’60s the timbers and overhead bracing still displayed advertising for Kendall’s Spavin Cure, Herrick’s Pills, and Ayer’s Cherry Pectoral. The county repaired a lean in the bridge in 1966 by adding two large buttresses on each side. Two new windows cut into each side provided a safe place for young folks to fish and allowed more light into the dark interior. 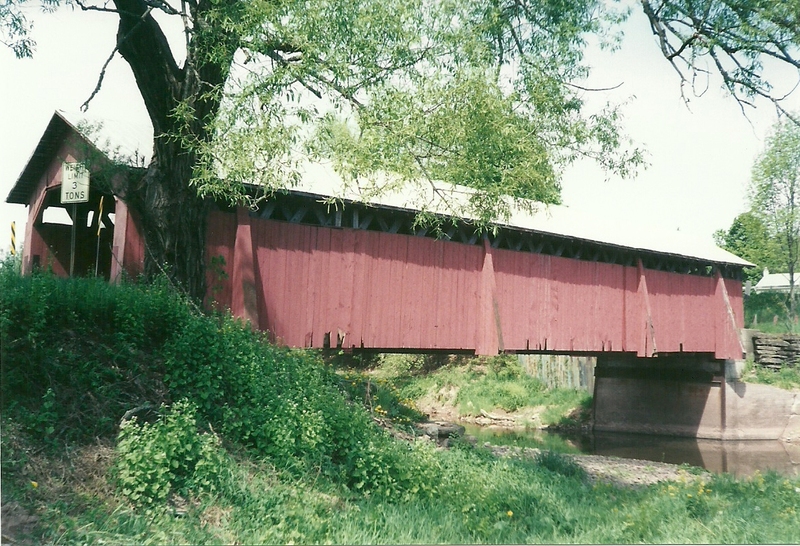 That same year, the bridge received its first coat of red paint. In 1967,the portals had a diagonal appearance, but sometime during the late ’70s or early ’80s the portals were squared off. 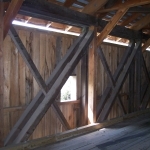 Rehabilitation of the Hamden Covered Bridge began in the summer of 2000, with contractor W. L. Kline, Inc. in charge. It included replacement of the tin roof with a standing seam metal roof. Decayed bottom chords were replaced with a single 130-foot glue-laminated chord manufactured by Unadilla Laminated Products in Unadilla, New York. To keep as much of the original Long truss as possible, some truss post members were relocated to accommodate stress levels in different areas of the bridge. On November 13, 2000 the bridge was moved back across the west branch of the Delaware River and the rehabilitation completed at a cost of $708,000. 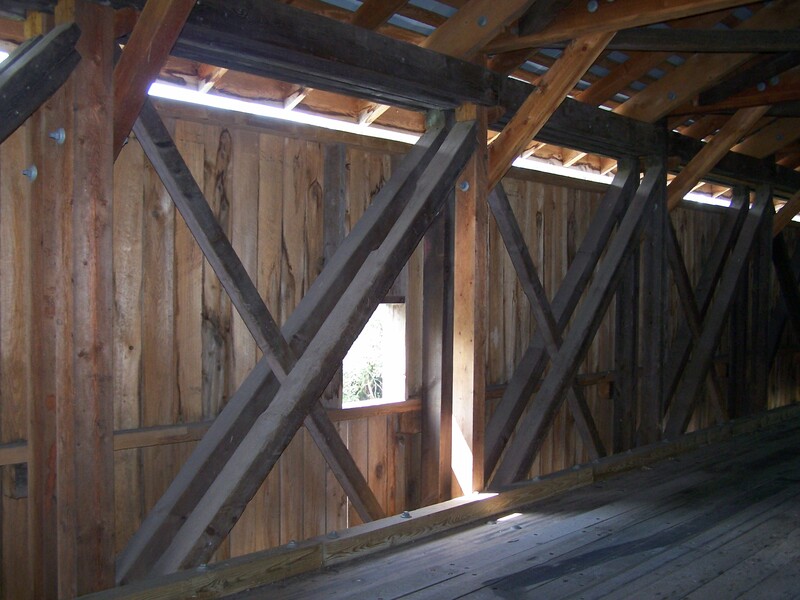 Great care was taken during the rehabilitation process to restore the Hamden Covered Bridge to its original beauty. With the buttresses removed, and the diagonal appearance to the portals returned, she now stands straight, cambered and proud — a single span structure once more. The bridge can be seen from State Route 10 at the East end of the Village of Hamden, on the right while proceeding Northeast.